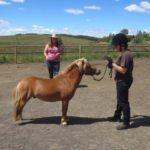 This past weekend was the second time I’ve taught a driving clinic at the beautiful Horse In Hand Ranch, at Blackfalds, Alberta. It’s such an elite facility, it’s still a bit amazing to me that I get to play there. 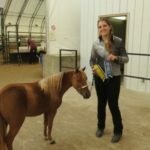 Last time I taught there I wasn’t well enough to drive a horse, so this time I was determined to bring my own horse so I could play in that gorgeous arena with the perfect footing. Two years after I first saw it, I finally got to drive and it was worth the wait! I hooked Rocky up early Saturday morning and we had the best drive of his life in that huge empty ring, quiet before everyone else arrived for the day. We started the clinic with a classroom session on show ring driving vs dressage training, and why I find classical dressage principles such a valuable tool to help my driving horses achieve success. We also touched on learning theory, and how important it is to work with your horse, not against them. 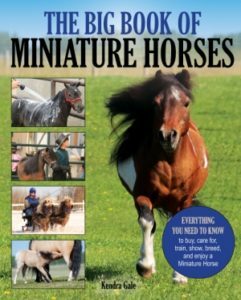 For members of the Miniature Horsemanship Community, my video on the day only captured a few minutes (don’t know why, wasn’t a good weekend for my technology! ), but you can find it below. Make sure you’re logged in to see it! 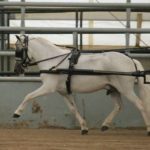 There were 13 horses participating in the clinic, and they each had a lesson both on Saturday and Sunday. Thanks to everyone who attended for letting me collaborate on their driving horses! That’s always how I think of a lesson – it isn’t me telling you what to do, it’s us working together, along with your horse, to find the best way to create improvement. 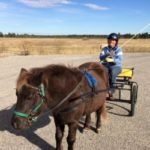 I enjoyed every lesson – even by the end of the day, when my feet were shouting at me (I took over 25 thousand steps each day) – I still find the moments where we find the right approach and the horse suddenly makes an improvement SO exciting! Sunday morning I hooked up Rocky for a real life demo/discussion of planning a training session. He wasn’t the focused, relaxed and keen horse I’d had in the quiet of the empty arena on Saturday morning. Instead, he was tense and distracted, which actually worked quite well to demonstrate the benefits of relaxation, bend and rhythm, and allowed me to show a number of exercises I use to encourage those things. You can see video clips of that demo below if you’re a member! I don’t think I’ve ever been to a facility more welcoming to Miniature Horses. The staff at Horse In Hand could not have been more helpful, and they made sure that the footing was perfect for us. The caterer was, as always, fabulous, and even made a special request lunch for Tayten’s birthday. We had a delicious potluck supper on Saturday night, thanks to everyone who cooked and helped clean up. I hope everyone who attended had a fun and productive weekend!